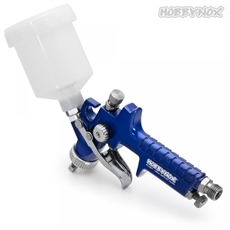 Hobbynox RUBY - Top-Feed Mini Spray Gun Set The RUBY Mini Spray gun is a true workhorse and it’s perfect for booth painting and clear-coating medium to larger models or other hobby sized items. It works equally good with waterbased non-toxic paints such as our Hobbynox Airbrush Colors or similar from Createx or Parma Faskolor and also thinner-based paints and automotive 2K urethane clear-coats. Another good application is spraying Bittydesign Liquid Mask (with the optional 1 mm needle set)! The RUBY is a complete set that is ready to be used and it connects easily to the AS196AW Hobbynox Airbrush Compressor or any other larger air compressor with an airfilter that has an G1/8 BSP male threaded coupler. Note, the printed manual is a little bit unclear regarding the exploded view illustrations etc - please download the pdf manual if you need to see them more clearly!